Input text: the silver [sky] texture is on the sky. the [sky] texture is 1600 feet tall. the ground is transparent. the small frog. he faces southwest. the very tiny gold crown is above the frog. it is -3.5 inches to the left of the frog. it is -3 inches in front of the frog. the small girl is -2 inches in front and -5 inches to the left of the frog. she faces northwest. 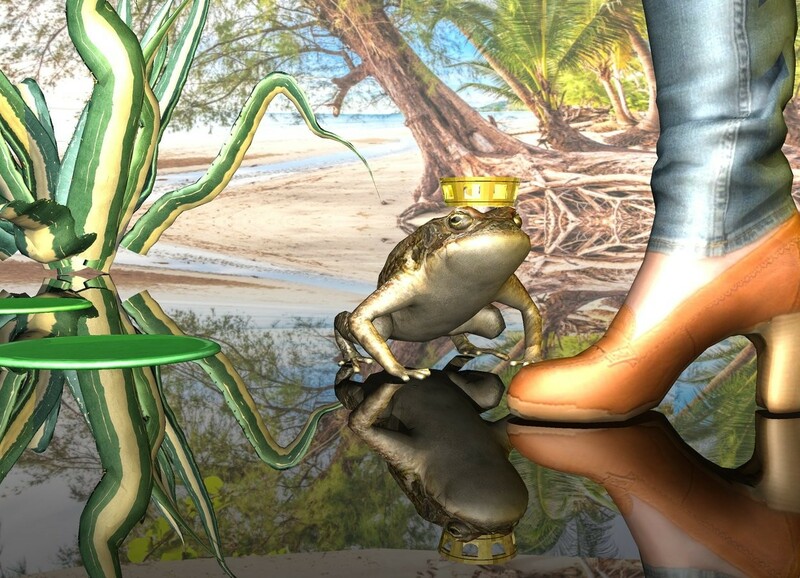 the gold light is in front of the frog. the first small green pancake is 2 inches behind the frog. the second small green pancake is 4 inches to the right and 4 inches behind the first small green pancake. the century plant is 1 inch behind and 9 inches to the right of the first small green pancake. the gold light is above the frog. the gold light is below the frog.